Things first began to go wrong, Luis Buñuel teases us, in Spain in 1808, when Napoleon's troops arrived to liberate Toledo. In the opening scenes of Buñuel's savage comedy, "The Phantom of Liberty," the soldiers execute those who would not be liberated. "Down with freedom!" cries one of the doomed. It is the cry of a defeated social order. The French and American revolutions have unleashed freedom on a defenseless world, and forevermore the population will be unable to rely on the authoritarian reassurance of church and state. After a scene of typically Buñuelian surrealism -- a drunken soldier tried to embrace a marble woman, and is banged on the head by the sculpture's husband -- the film's action moves to contemporary France and stays there. But it doesn't stay in any one place very long. The movie's a fluid, dizzying juggling act of many stories and cheerfully bizarre coincidences. Buñuel sweeps us into each new vignette so quickly there's no time to hang around while the last one is tidied up. We meet characters, they confront a crisis involving insanity, illegality, doom, fetishism, institutional stupidity or all of the above, and then, just as the cause of the crisis is revealed as a paradox, the characters cross paths with a new set of characters and we're off on their heels. Buñuel's camera often enters a scene with one set of characters and leaves with another, a device that was used again in "Slacker" (1991). If I attempted to describe them, Buñuel's interlocking yet disconnected stores would sound bewildering. But his film is strangely lucid; it has the heightened reality of a dream. This material couldn't work if the director weren't supremely confident. And at the age of 75, when most directors are dictating their memoirs, Luis Buñuel was still refining his style and finding new ways to humor his pet personal obsessions. 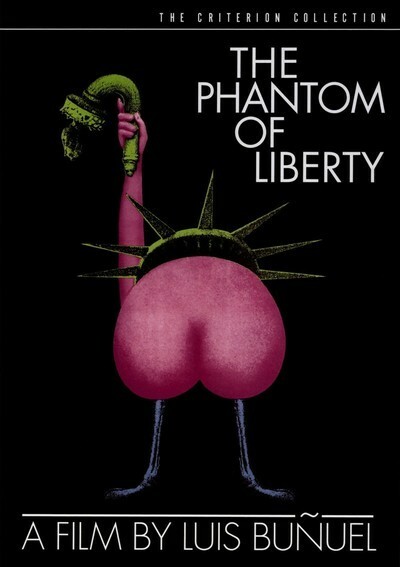 "The Phantom of Liberty" uses his usual prejudices and fetishes to play variations on his favorite theme, which might be stated: In a world cast loose of its moorings by freedom, only anarchy is logical. In "The Phantom of Liberty," for example, one of the most shocking yet funniest scenes takes place in a wayside inn. Four monks pray for a woman's ailing father. They join her in a poker game, only to be invited to another guest's room for port. The other guest and his female companion disappear, then leap back into sight (she dressed in leather and with a whip), primed for flagellation. As the shocked guests rush out of the room, the would-be victim says plaintively, "Can't at least the monks stay?" In another scene, a mass killer, found guilty, is released and signs autographs. Guests are cheerfully scatological at the dinner table but sneak into the bathroom to eat their dinner. A man in a playground gives a little girl postcards ("Show them to your friends but not to adults!"). When her parents see the cards, which are views of historical landmarks, they fire the girl's nurse. Another little girl is reported missing at school, even though she is quite clearly there and accompanies her parents to the police station. And so on. The most impressive thing about the movie is the way Buñuel leads us effortlessly from one wacky parable to the next. We ought to be breathless but we aren't because his editing makes everything seem to follow with inevitable logic. It doesn't of course, but that's freedom's fault: If people want liberty, they shouldn't be expected to count on anything. "The Phantom of Liberty" is a tour de force, a triumph by a director confronting almost impossible complications and contradictions and mastering them. It's very funny, all right, but remember: With Buñuel, you only laugh when it hurts.